I’d like to share with you three reader reviews of In the Field of Grace. These reviews were originally published on Amazon, and the authors have given me permission to reprint their reviews on my blog. I need to remember to not read Tessa’s books just before bed…I know it will happen – it always does! I say to myself, “One chapter, just one! Maybe two…” But then I read through the night and when my eyes finally rebel and say no more it’s almost time to get up for the day! Tessa has honed her story telling talent well! She fleshes out Biblical characters and makes them real people, so real it feels like maybe I could be sitting in Ruth’s living room hearing her tell her story. Ruth struggles with some of the same things I do, and as she learns new things about trusting God and becoming more like Him, so do I! There are light bulb moments and there are laugh-out-loud moments. I cried along with Naomi, Ruth, and Boaz as they lose loved ones and struggle with God in the midst of such deep sorrow and celebrated in their joy. Another well done book by Tessa Afshar! It did not disappoint. It was as challenging and as entertaining as I anticipated it would be. Tessa Afshar has outdone herself this time. This book is incredible. I was completely hooked after the first chapter, and couldn’t put it down. I just absolutely loved Ruth, Boaz and Naomi. 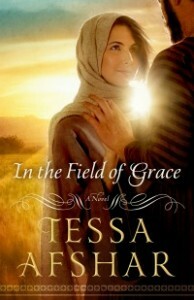 The Bible came alive for me, as it always does when I read Tessa’s books. I love how Our Lord speaks to me in her words, and actually allows grace, wisdom and strength to flow in my own life from the pages of her book. Tessa has such knowledge of the Bible, and is incredible with her gift of word imagery. In the Field of Grace is definitely a must-read! This was an intriguing love story. The way Tessa Afshar writes makes it hard to put the book down and you end up never wanting the story to end. She did it again with In the Field of Grace, the story of Ruth and Boaz. I love how she expanded the story but still keeps it in line with historical and biblical facts. The reference to the pearl earring from her book, Pearl in the Sand was great… love how she ties things together. This book ignites your passion and love for the living God. It also lets you see that God is in every detail of your life working things together for your good….it all becomes a part of the big plan called PURPOSE/DESTINY! Highly recommended. In the Field of Grace has made it to the Best Seller List on The Vessel Project. Congratulations. Such a wonderful book.